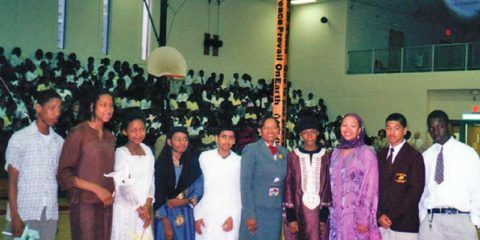 Katherine Shamsid-Deen (purple dress) and principal Joanne Douté-Cooper (gray suit) with youth presenters representing many countries, announce “May Peace Prevail On Earth” in eight languages. 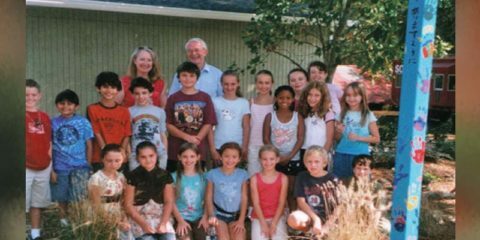 High Meadows is an International Baccalaureate World School, inspiring children for over 30 years to think critically, learn creatively, act globally and live compassionately. 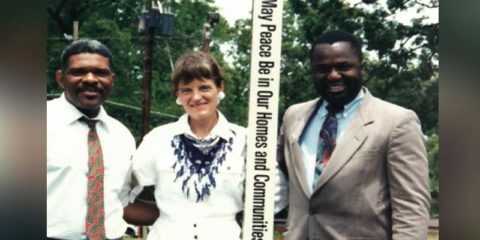 Pat Williams (center) heard Andrea was gathering information about Atlanta Peace Poles and sent her this photo which was taken with her co-worker Art Hines (right) in 1996. 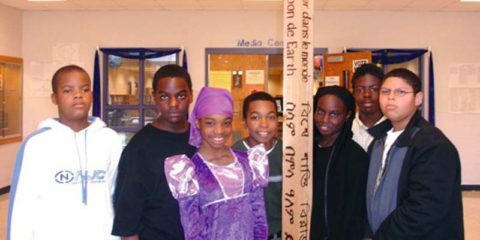 When Carver was rebuilt in 2005, the whereabouts of the Pole were unknown.